The Ocellaris Clownfish may be one of the aquarium industry's most popular marine fish. 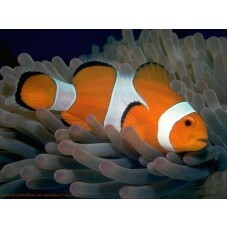 Its beautiful orange body dressed with white bands outlined in black instantly distinguishes the Ocellaris Clownfish. This member of the Pomacentridae family is an excellent addition to almost any saltwater aquarium system. What makes this specific variety even more appealing to aquarists is the fact that each Ocellaris Clownfish is captive-bred to help protect the fragile reef environments of the world.